Are you mystified by the New Age? From flea-repelling crystal pet collars to Machu Picchu package tours, the New Age movement offers a delicious variety of services and products for every spiritual want. But can your local crystal shop give your chakras a tune-up? Dare you trust an ad in the back of a magazine to solve a right brain-wrong body problem? In 101 WAYS TO AVOID REINCARNATION, Hester Mundis presents the first no-nonsense guide to enlightenment. For the 43 percent of us who believe in a higher power-and the remaining 57 percent who would like to hedge our bets-Mundis shows you the easy way to take charge of your afterlife. Learn Healing with Money. How to Decorate Your Own Inner Space. Mealtime Mantras. 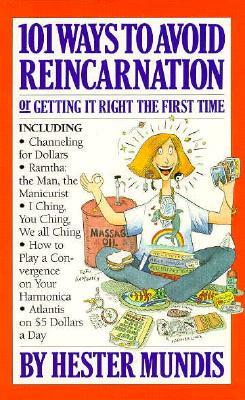 For the harried career woman, The Tao of Shopping shows how to pick up metaphysical bargains. Businessmen will appreciate the teachings of the One-Minute Meditator. Perfect for student travelers is Atlantis on $5 a Day. Following the teachings of 101 Ways to Avoid Reincarnation, your spirit will be happily booked on the Astral Plane, in first class.